˜Elegant Karjat˝ bungalow project is located at Karjat in the midst of nature surrounded by Sahyadri hills, Bhima shankar hills, Chillar river and Kothaligad (Peth fort). On the outskirts of Mumbai, the nature bounty project ‘Elegant’ is surrounded with hills, Rivers, Waterfalls and Greenery. It is situated on a mountainous region that spans over the Bhor ghat, Sahyadris and western ghats of Maharashtra. 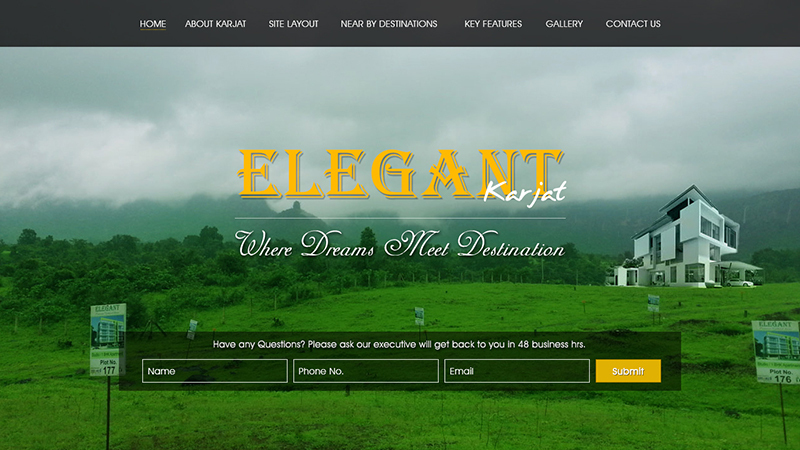 ˜Elegant Karjat˝ is spread across 70 acres of land, beautifully designed and carved to create exclusive and well planned designed infrastructure made with superior quality materials. This is a perfect gateway destination for people looking for peace with comforts at one of the best place in Maharashtra. Complete entertainment facilities for kids, teenagers and elders. This entry was posted in portfolio, Web Designing, Web Development and tagged bootstrap, HTML5 & CSS, jquery, Singal-page Application (SPA), web development. Bookmark the permalink.